Paris Jackson took to Twitter to hit back at rumors she's struggling with her mental health on Saturday. 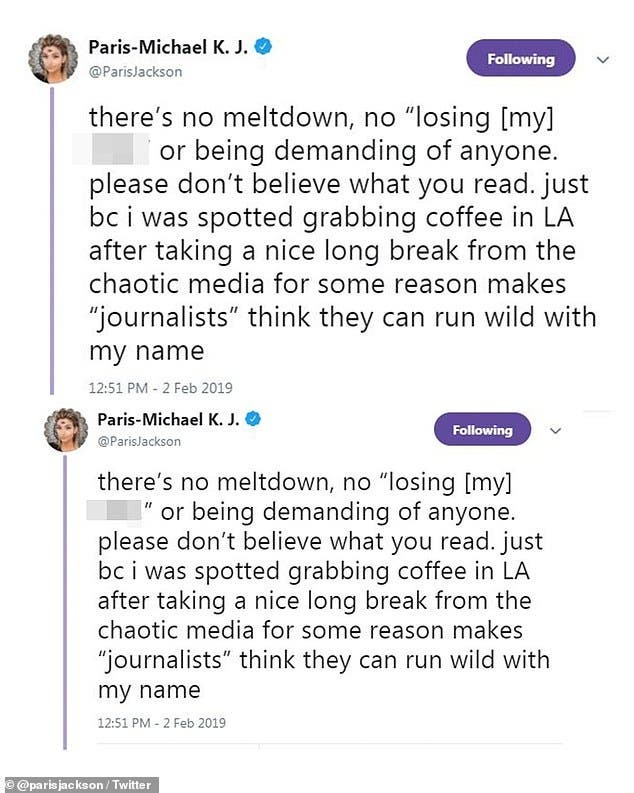 But Paris denied such gossip in her tweets, sharing: 'There's no meltdown, no 'losing [my] s***,' or being demanding of anyone. And Paris certainly seemed in good spirits later in the day, when she shared an Instagram of her dog Koa sitting at a restaurant with her. 'My date is cuter than yours' the Sunflowers singer joked in her caption. She certainly didn't seem worried about the recent premiere of the documentary Leaving Neverland, which details abuse accusations against the Man In The Mirror singer. On Monday, her family released a rare public statement after the film was screened at the Sundance Film Festival. 'Michael always turned the other cheek, and we have always turned the other cheek when people have gone after members of our family - that is the Jackson way,' read the statement. The explosive four-hour film, which was screened in Park City, Utah, makes a number of damning accusations against the singer, who passed away in 2009 from a drug overdose. This all comes just days after reports she checked herself into a treatment center to deal with her 'physical and emotional' health. The IMG model has been 'struggling' with her mental health for some time according to an insider who spoke to People. However, Paris recently took to social media to promise fans everything was OK.
'Yes I've taken a break from work and social media and my phone because it can be too much sometimes, and everyone deserves a break, but I am happy and healthy and feeling better than ever!' she said.